LEGO has started to upload images of 2019 sets to its server, including those for the year's seasonal sets which are, once again, BrickHeadz! Three of them will be available at the start of the year: 40348 Birthday Clown, 40349 Puppy and 40354 Dragon Dance Guy, while 40350 Chick will be the Easter offering, 40351 Ghost for Halloween and 40353 Reindeer, Elf & Elfie for Christmas. You'll find pictures of them all after the break and of the first three in the database. Are you glad that we are going to have more seasonal BrickHeadz or were you hoping for a return to vignettes? I can't wait to get hold of the levitating brick in the ghost! I like the texturing on that chick. I wonder how they will make the ghost float? Pretty good quality! No beating that Ghost. I've always thought the season vignettes were some of Lego's best work (the Christmas ones always provided beautiful extra pieces of scenery for the Winter Village). And I actually do think the Ghost and Dragon Dancer are quite well-designed ... but I don't own a single Brickhead and I'm not about to start now. It's money saved (that I can put towards all those great new City sets), for me. Love the ghost! Instabuy from me. I was hoping for a return to vignettes but that LEGO isn't doing so doesn't offend me. My kids like Brickheadz so we'll end up with some of these in our house. They're all really cute designs. Ugh, more creepy Brickheads. But they're holiday, so will pony up.. So, are those reindeer fangs or is it rabid? I love every single one except the puppy. The ghost is one of the best! I'd buy most of them including the clown for parts to build something much better.. The candle beneath that flag in 40248 Birthday Clown is an accident waiting to happen. I thought the reindeer had a furry chest ... but the more I look at it, the more he just looks rabid. Is the Dragon Dance Guy an Asia-Australia exclusive? Man, wouldn’t want THAT reindeer driving my sleigh! Looks like he would turn on you and eat you for Christmas dinner!! Hoping for the vignettes, but these are all pretty good. If nothing else, Brickheadz are often great parts packs the way Mixels used to be. Parts in interesting colors, tiles with interesting prints, etc etc. Is that Dragon Dance Guy another China exclusive, or are we getting that one state-side? ^ It could be, although the fact images are on the shop.LEGO.com server suggests it'll be sold online. I’m really happy to see that Lego didn’t kill off Brickheadz. Only the ghost interests me because of its exclusion of Brick Headz creepy eyes. I can't help but hope LEGO decides to sell 80101, 80102, 80103 online because if they only leave the rest of the world with just 40354 Dragon Dance guy that's messed up. And although I really don't care for Brickheads, I must admit, these are pretty well done and borderline appealing to me. 1. That clown is going to catch both the birthday sign and his hair on fire. 2. The puppy is cute, but I don't know why he's bringing me romantic gifts. That's not what I look for in a pet. 3. Chick looks kinda like he's wearing a yellow version of the Black Panther necklace. Wakanda tech in the barnyard! 4. I like the ghost of course, but I think it's a little misleading to show it actually floating instead of picturing a transparent brick or anything under him. 5. What is up with those reindeer teeth?!? It never even occurred to me it might be fluffy white chest fur until someone mentioned it above. Still, I like it, dental problems and all. 6. I'm not into elves. I've got no interest in BrickHeadz at all - most disappointed that we're not getting any vignettes. Still - sounds like plenty of people are happy. Just means I can save my money for something else. No thanksgiving set on there then. Wonder if there will be something else? There's a gap in the numbering. I guess 40352 (BrickHeadz #84) will be the Thanksgiving set. No seasonal sets for me next year then, I will maybe try and get some of the older vignettes, but that doesn't do Lego any financial good just some resellers. At least they look good. I am happy that this series is continuing, I want that chinese one. "I don't know, sometimes I feel like I'm the only person who doesn't get Brickheadz." Believe me, friend, you're not the only one. I am quite bummed by this. I like my vignettes!! I love the new gold parts in Dragon Dance Guy. Was hoping for vignettes, mainly because they were really good value for money to get minifigs and accessoires, but these are nice as well. The dragon dance guy looks to be my favourite brickhead I've seen so far. I was going to say these are less horrifying than previous offerings, but then I saw the teeth on that reindeer. Must be a vampire-reindeer hybrid. I'll hold out for the return of the vignettes. Love those. Wow.... thanks for saving me money LEGO, these are awful, besides the ghost which isn't worth $10. Very sorry not to have vignettes in 2019 but for some reason I much prefer these Brickheadz to the seasonal ones for 2018. These seem cuter and more natural somehow--even the elves, which don't normally appeal to me (still less in blocky formats) are rather sweet. Perhaps TLG didn't think they would have Brickheadz in 2020, so moved these designs out of order? "Dragon Dance Guy" is a really bizarre way of naming that one... Why not just "Dragon Dancer", I wonder? > but then I saw the teeth on that reindeer. I love vignettes and didn’t get any of this years seasonal BrickHeadz although I like BrickHeadz in general, but I’m definitely picking up a few of these next year. I adore that ghost and the dragon dance guy looks amazing as well! The reindeer is terrifying. I saw it as white chest fur at first but after reading the comments I can’t stop seeing teeth. That's not teeth on the reindeer- it's foaming at the mouth because it's got rabies! These look pretty good, especially the dragon dance guy. I did really liked the reindeer too, but then I read the comments, and now teeth are all I can see... While these are pretty good I would much prefer vignettes. I loved all the seasonal sets from 2017, they all had a couple good figures and a Ton of good parts. Hopefully they return next year. Mostly just excited for all the white PLATE 1X2, W/ BOW, 45 DEG. CUT on that ghost. I go through so many of those and they're still so damn expensive, its nice to see such a good source of them. Oh and the half-rounded 1x1 tile in black, thats a thing I need too. I'll miss the vignettes, but maybe this will mean we'll appreciate them next year? Not a huge fan of Brickheadz, but the puppy is almost cute. The elves will be good to add to the current Santa and Mrs. Clause Brickheadz. There reindeer. There North Pole! To those confused about the reindeer teeth, I don't get it. I can't see it as teeth even if I try. Am I weird? Also, I don't see a picture of the Dragon guy in the article. Was that intentional? Surprised nobody mentioned that the Christmas Brickheadz for next year form the first 3-pack together, and for $20 (1 $10 reindeer + 2 $5 elves). For people who noticed the Brickheadz number 84 being missing, there are 4 other missing ones. The way I realized this is because when I went to add Birthday Clown to my ever growing list of Brickheadz, I noticed his number was 92, leaving 88-91 between it and number 87, Elfie, (which I don’t understand the name of). Also, I have to agree and hope that number 84 is probably a Thanksgiving one (even if some people on different parts of the world couldn’t care less about Thanksgiving). All those commenting on the Reindeer's "teeth" have clearly never seen a Reindeer. I suggest a Google search is in order. They have a distinctive ruff of white fur under their neck/chest area. As to the Brickheadz/vignette question, I don't buy Brickheadz and would prefer the vignettes, but normally miss out on most of them, so this is actually good in a way. I don't feel like I've missed anything I was after. That's actually a bit annoying. I was vaguely tempted by the idea of buying nine copies of the reindeer and swapping one of the noses, but that just doubled the price. I don't know why y'all are making fun of the reindeer. Haven't you ever heard of Rudolph's second cousin, Cletus the Snaggletooth Reindeer. There is something about the whole range that I find irresistible. Certainly the Australian market likes them. Most of the sets are usually out of stock on shop.lego.com for us, with some even having been listed as retired months ago, even though they are available elsewhere (e.g: Harry Potter and Hedwig). I'll be snapping all of them up! Really cute and creative! Even the clown is simple and cartoony enough not to have that visceral creepiness that some real clowns have. My favorite is the reindeer, but I also love the ghost and puppy! That's not to say the more human-looking ones aren't charming in their own right but the animals and magical creatures tend to stand out a lot more from the sorts of characters we see so many of in licensed sets. It surprises me that they're not going back to vignettes as they have in the past several odd-numbered years, though. Wonder if that means the seasonal BrickHeadz have been more successful on a global scale than past seasonal sets? @MTBrickhouse: I still don't get why people are any more creeped out by BrickHeadz eyes than minifigure eyes or classic Fabuland eyes. They're both just shiny black circles, it's just that the BrickHeadz eyes show reflections from a square light source like a sunny window or photographic softbox lighting, rather than a round light source like direct sunlight. You can see similar rectangular reflections in some MOC photos I've taken like https://flic.kr/p/XKPSiP, in which I lit the subject using three softboxes, instead of using a bounce card to further diffuse the light or using multi-capture photography to edit out the sharper reflections. I can totally understand being creeped out by stuff like the lack of mouths/noses, but the eyes are probably the most normal thing about the BrickHeadz compared to more traditional LEGO animals and minifigures. I'm beginning to feel like AFOLs actually prefer interpreting harmless, lighthearted stuff in creepy or gruesome ways, as opposed to acknowledging its cuteness on a more sincere level that isn't as "edgy". I half expect people to start claiming that the Duplo rabbit is red because its fur and skin have been stripped away, leaving only raw, bloody tissue, or that Fabuland characters' heads are so big because they all suffer from untreated hydrocephalus. Then again, it could also be as @privatematrix says. I wouldn't be surprised if many people are so used to media depicting Santa's reindeer as white-tailed deer look-alikes that they don't realize actual reindeer look different than that. @Agent R2: Interesting point! I hadn't even noticed that myself until you called it out and I scrolled up to confirm. Ooh the puppy is cute! @MataNui2009 I imagine they'll make this ghost float the same way Slimer did--a stand made of clear bricks. There goes the hope that 2018 would see the end of Brickheadz. Lazy releases from Lego, spoiling what, until 2018, had become an annual tradition for many collectors. Sad to see Brickheadz continue. Even Mixels were better. I loved the seasonal Brickheads of 2018. I wish there wasn't such a long gap through the summer to get to the Halloween set. They set on top of my locker at work when seasonally appropriate. They're fun little builds. I was hoping for the return of vignettes, I prefer those as display pieces. They're good quality and they probably sell well, I prefer the return of vignettes though. @Aanchir: I think it is not the look of the eyes themselves that creeps/freaks people (myself included) out, it's their position at the edge of the "face". The lack of a nose and/or mouth on many of the BrickHeadz just adds to their creepiness. I have given up complaining about them as no one cares about what I want anyway. I simply use the more interesting BH's for the same thing I used most of the Mixels, which is as parts packs - when they are available for a substantial discount. Difference being that Mixels were better value for money from the get-go, plus discounts on those tended to be higher. And some BH's aren't even too bad imho. Just built Boba Fett and must say that was a pleasure. Also others like Dumbledore, Doc Brown & Marty or that new Puppy are above the norm to my eyes. And man, that Ghost. Love the levitating brick. Love the ghost and Dragon guy, rest are OK. But the clown still counts as creepy to me, but that's just clowns in general. I'll probably still get it though for the Happy Birthday tile if it is printed (although I think I can see sticker lines). While I do like some BrickHeadz, the vignettes were miles better! I would not mind an occasional BrickHead here and there, but I don't like how Lego is forcing them everywhere. Best they alternate them. Surprised noone's mentioned that unlike many other Brickheadz these have no prints, just brick built details! More Brickheadz, more easy passes. Doesn't matter what they are, what theme they're from, there's not a single one I like. I like a couple of these, the clown and ghost, however definately miss the vignettes. Hoping we'll see a return to those fun little scenes and great Minifigures some year soon. To answer all your questions about the ghost, they probably will do someing like Slimer and how he floats. 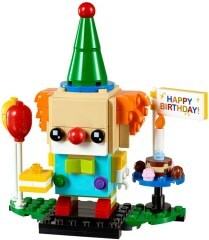 I do hate clowns for no reason but the 40348 Birthday Clown looks very cool and festive! I think all of them looks great and sure must-haves. Well done LEGO! Love the Reindeer and Puppy! So Brickheadz are the new vignettes? Way to go, Lego. Have to admit though, that ghost ain't half bad. Might just become my first BH. I have too many projects on my plate right now, and I mostly stick to minifig-scale anyways, which allows me to work a lot of my stuff into our many club layouts. It also helps keep costs down, which is a big deal because I regularly pack around 200pcs into any 6-wide car I design. Heck, I just finally completed a 6-wide Mater to go with some Cars and Cars 2 characters I built back in 2012, and according to my LDraw file he clocks in at a whopping 317pcs for a tow truck that's about the same size as the one in the upcoming modular Corner Garage which probably doesn't run much more than 100pcs. I’m disappointed they are Brickheadz again since I’m not a fan, oh well. I like Brickheadz just fine, but I was really hoping the seasonal ones would be done this year, as LEGO seemed to be changing it up a bit each year. Those elves are creeping me out and the reindeer looks rabid. I've been collecting seasonal sets for a long time and most of the Brickheadz, but this isn't keeping me hooked. I think Brickheadz work better for licensed characters, all Funko-like. The seasonals are way more fun with vignettes and minifigs. Thinking about it, I wonder if one of the motivations for continuing to do BrickHeadz as seasonal sets is that they tend to have more lasting appeal and display value in the "off-season" than seasonal vignettes. I can easily picture people continuing to display their BrickHeadz (seasonal or otherwise) year-round, just as many people display their blind-bag minifigure collections year-round even though some of those (Series 6 Leprechaun, Series 7 Bunny Suit Guy, Series 8 Santa, Series 11 Holiday Elf and Gingerbread Man, Series 14 Skeleton Guy, Series 16 Cute Little Devil, etc) have either an incidental or overt seasonal theme. As fun as they were in their own right, I generally can't say the same about the year-round display value of some of the seasonal vignettes and seasonal brick-built characters with a less consistent design language. They almost got me to buy a brickheads but since the ghost is white and not glow in the dark I will have to skip it. Also not a fan of the brickheadz... ugly & creepy, imho. Bummer that they don't have vignettes also, for those of us who prefer them. Well, but Christmas is very much a special exception. There's always at least one set (and sometimes two) for the annual seasonal series, which runs most of the year and hits several holidays. But beyond that, they have one or more GWPs (this year is up to three), sometimes they have additional [email protected] exclusives that are just available off the shelf, and there might even be polybags that end up being sold by other retailers. Beyond that, Halloween is the only other holiday that really gets much in the way of extra sets most years. The curious thing is that they're doing all these Chinese New Year sets for the Asian market, but I can't really think of any New Year sets that weren't Chinese in nature.